Breaking: GOPers Refuse to Let Trump Stop the Caravan! Lat night, under the cover of darkness, the illegal migrant caravan started fording the river to sneak into Mexico. When the sun rose, the caravan had completely re-formed behind the Mexican police checkpoint and had amassed to more than 5,000 people. They just started marching towards the United States again. Trucks and busses have started arriving to carry the migrants north and UN officials are on location teaching the caravan how to game the US immigration system to get into our country. Yesterday, Trump issued the biggest threat of all. Instead of calling up the National Guard to secure the border, he is going to mobilize the Army to shut this caravan down. Within minutes, Congressional leadership had already threatened to block the vote on the Congressional waiver. At every turn, Congress is trying to shut President Trump down to keep the border wide open for the Caravan. Take a look at the picture above. This is the caravan AFTER it snuck past the Mexican border checkpoint. It's larger than ever before. If Congress does nothing, these people will be inside the United States by this time tomorrow. President Trump is doing everything he can, but he needs your help to force Congress to take action... and we are officially out of time! Please, send your instantly delivered FaxBlast to Congress and FORCE them to shut down the border by any means necessary! Late last night, thousands of migrants in the Honduran caravan forded the river separating Guatemala and Mexico. They snuck across while the Mexican police were sleeping and continued marching towards the United States. When the sun rose this morning, the caravan had reformed in Mexico and totaled more than 5,000 people. Not only did Mexico utterly fail to halt the illegal migrant caravan, but it is even bigger than it was two days ago! But this isn't a humanitarian crisis. This is an invasion. These people believe they have the right to enter the United States and they won't stop until they do. If this was only about fleeing Honduras, then they would have settled in any of the countries they have already traveled through. Next, Trump threatened to deploy the National Guard to secure the border. But Democrat and moderate Republican Governors refused to allow the President to deploy their troops to the border. So, Pres. Trump was left with one option. As Commander in Chief, he can deploy the Army to the border to stop the caravan from entering. But even there, the President needs a Congressional waiver. And many of your colleagues are again promising to block any vote on a waiver. What is your end game here? 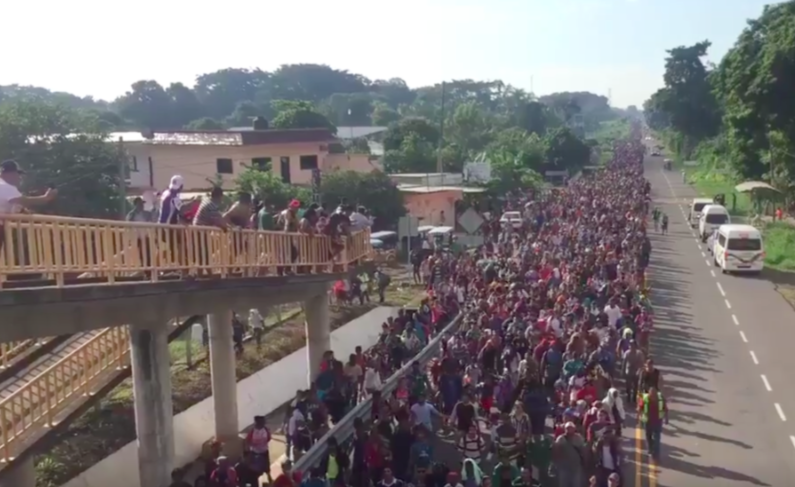 There is a caravan marching on the US border that grows in size every single day. Not only are you refusing to do anything about it, but you are actively blocking the President from taking action on his own. If this caravan enters the United States, your political career is over. I just want to make sure you fully understand this. If you do not do everything in your power to stop this caravan from getting into the country, you will be removed from office. You swore an oath to protect this country and her people. If you refuse to do anything to stop this caravan, then you will have violated this oath.